Like many Jewish people I often get tired of all the marketing geared to a Christian audience. While Christianity is the most common religion in the United States, the Christmas and Easter themed advertising sometimes goes too far. But that doesn't mean I'm looking for big corporations to draw on Jewish holidays to use in their marketing campaigns. So, I was surprised when I opened an email message today from Spirit Airlines with the subject line: "Don't Passover These Low Fares From $19.80* One Way!" At first I thought it was a spoof message from a Jewish humor website. I read the rest of the message and was surprised by the many references to the upcoming holiday of Passover. The many references in Spirit Airline's email to Passover even made question if I had been religiously targeted by the airline. Was it because I had three trips in March with Spirit Air and they noticed my yarmulke? Was it because I have "rabbi" in my email address? I wondered if any other major company had ever conducted a promotion tied into Passover. The Spirit Airlines Passover promotion is also odd because it was launched the day before Passover. If the company's intention was to get people to book their Passover flights with Spirit, it's too late for that. Most of the qualifying flights in the promotion have dates in May and June. Perhaps, the Spirit marketing department should have considered a Shavuot sale (no obvious puns there). The other thing that is odd is that I didn't receive an Easter promotion from Spirit Airlines even though that (more widespread) holiday takes place this weekend too. 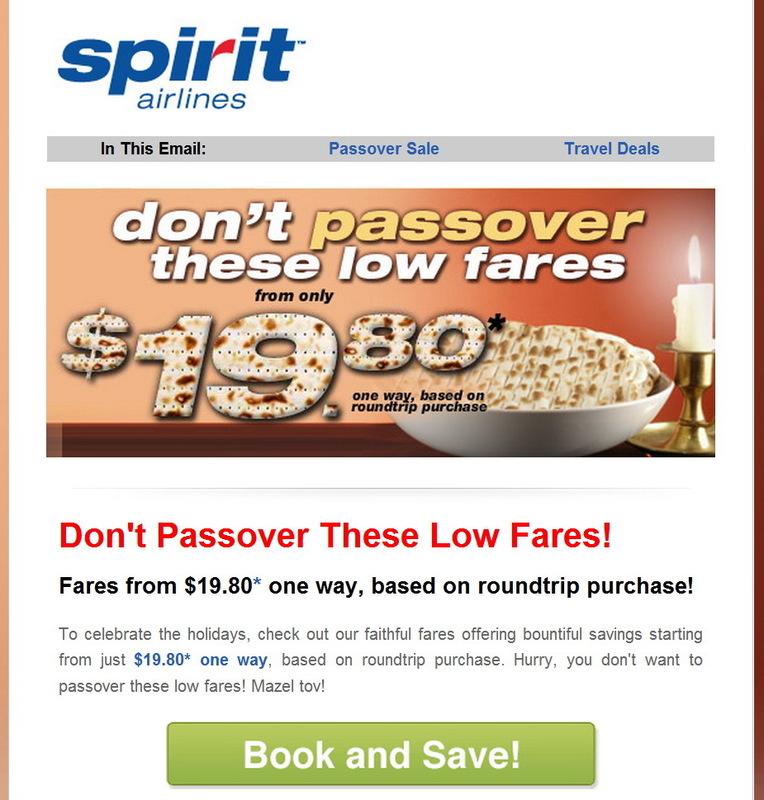 A little research on the Web showed me that Spirit Air used the same silly pun ("Don't Passover These Deals") last year in a marketing email. So, I guess their marketing team isn't that creative after all. And they really overdid it on the kitsch (no need for the "Mazel Tov!" greeting at the end of the ad). My only comment after flying Spirit thrice last month is that air travel shouldn't feel like such a PLAGUE (no leg room! ), the gate agents should act like the mean PHARAOH forcing me to pay extra for each carry-on bag I bring on board, and I yearn for the days of FREEDOM when complimentary drinks and peanuts were served on flights. Hmmm, maybe there really is a Passover connection with Spirit Airlines! I enjoyed your piece on Spirit Airlines. The only thing I want to say is that you griped about not getting any free drinks or food and the leg room. I dont understand why people find it impossible to understand that when you pay dirt cheap ticket prices you dont get anything for free. Do you get free drinks or food when you go to a theater or play?? If you want free drinks then fly Delta or United and pay twice for the ticket and enjoy your free drink. Hear here, to this blogger's notes to Spirit for needed improvements in their service. I flew Spirit today for the first time. (And I do not plan to fly with them again.) In contrast, SOUTHWEST makes the most of the last vestiges of remaining dignity air travel has to offer. The seats are comfortable, no baggage fees (checked or carry-on), they serve complimentary non-alc bevvies, provide snacks, and extend good cheer and good will while doing it. Spirit does not even provide WATER in flight. And, they made a rather exuberant solicitation to sign up for a credit card during the flight, all the while the passenger in the seat behind me jammed my kidneys with her knees-due to the LACK OF ADEQUATE LEG ROOM. I am 5 and a half feet tall and barely had room for my legs. There was not even enough room to open my laptop screen back far enough to tilt the screen back while it was on the seatback tray. Oh, and the cost of my flight on Southwest was less than half the dollar cost of Spirit's fare. I found this blog post online because I was curious about what the Spirit pilot said when we arrived at our destination: he announced "have a blessed weekend" over the PA. That had me wondering if "Spirit" air was a christian airline? or of some other religion? All told, I appreciate Southwest's efforts to provide SERVICE, and do so in a manner that respects its customers. Unlike Southwest, Spirit seems to rook its captive audience and stiff passengers using every angle they legally can. Spirit really needs to work on their business model and service operations. Did I mention my flight was delayed for 2.5 hours with no explanation given? They offered a $50 credit voucher in compensation that can only be used on purchasing a future flight with them in a short limited timeframe. My alternative suggestion: a one-time checked baggage waiver instead ($38 for one checked suitcase) would have instilled good will, but they refused. Spirit charges passengers $5 per boarding pass if a live agent prints your pass for you at check-in (free when passengers use DIY kiosks.) It's a wonder Spirit doesn't charge passengers to use the loo, too.